This entertaining Florence tour for kids is designed for the family and the intellectually adventurous traveler. Tailor -made to be family friendly; it allows young people to be introduced to the beauty of ancient art through a kind of ’time machine’: the daily life in a noble Florentine home between the 14th and the end of the 16th Centuries. You will begin with a leisurely historical stroll through the side streets of Florence, before crossing the Ponte Vecchio to the Oltrano district. Lots of fun options for the children, including the Stibbert Museum, which houses one of the world’s biggest collection of suits of armor, swords and century-old firearms and Piazza della Signoria, an open-air sculpture gallery and houses an incredible array of original sculptures of mostly mythological figures including Benvenuto Cellini’s bronze Perseus. Some of the exciting highlights on this tour include: Piazza della Signoria, and its incredible statues, the Duomo, one of the largest churches and domes in the world, and an Antique Carousel in Piazza Repubblica. 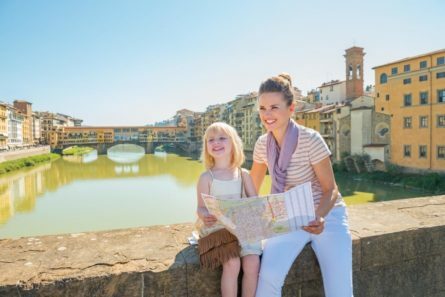 At the end of this Florence tour for kids, your family will have explored a wide variety of Florence’s history, with sites tailored to suite the interests of your children.